Choice of examination centre: Candidates have the option of choosing their examination centre, date and session through the online registration & scheduling system. Availability of test centre option is on a first come first served basis, and candidates will only be shown sessions that are available at the point of scheduling. 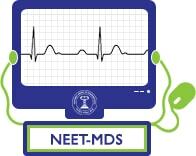 Test Centre Location: Exact address and location of the test centres are available on NEET-MDS website www.nbe.edu.in. Location map of the test centres is also available at the website. Candidates are advised to familiarize themselves with the test centre locations and ensure that they report for the test as per scheduled time only. Maps and directions to each centre are available on NEET-MDS website www.nbe.edu.in. Candidates are required to plan their travel accordingly. Note: Candidates are advised to familiarize themselves with the location of the test centre and plan travel time accordingly. Candidates have to reach the test centres on or before the reporting time. Candidates may note that late entry to the examination premises is not permitted under any circumstances. NBE shall not be responsible for any delayed arrival of the candidate in reaching the centre due to any reason. Checking and Verification: All candidates at the centre shall be frisked by security guards and biometric information shall be captured. 9.6Identity checks will be made upon arrival at the test centre to ensure that there are no unauthorized candidates appearing for the test. Candidates are required to cooperate with the security checks. Access to the examination centre: Please note that only the registered candidates will be allowed at the examination centre. Important: Friends or relatives accompanying the candidates will not be allowed entry in the test centre under any circumstances and will not be allowed to contact the candidate while the examination process is ongoing. Kindly note that the candidates shall be allocated to appear either in FORENOON session or in the AFTERNOON session i.e. the NEET MDS comprises ONE session/candidate only. Timing: Candidates may note that the reporting time refers to the time at which the candidate reaches the Reporting counter at the test centre. The candidate who fails to report to the reporting counter by the stipulated time as indicated above shall not be allowed to enter the examination premises that is Reporting counter and beyond. Reporting at the Examination Centre: The candidate should arrive at the Reporting counter at least one hour before the commencement of exam i.e. 9:00 AM for the morning session and 02.15 PM for the afternoon session. ID Verification – The original documents as having been indicated will be checked in the original. Security: Security Checks including frisking. Capture of Fingerprints – The fingerprints of all candidates shall be captured electronically and candidates are requested to cooperate with the on-duty staff with this process. Capturing of the Digital Image – As a security measure the digital image of the reporting candidates shall be captured and taken on record. Workstation: The test centre administrator /on duty staff shall guide the candidate to the assigned workstation. Reporting time: Kindly note that the reporting time has been indicated to timely complete the foregoing activities as well as to familiarize the candidate with the process. Entry Time: Candidates may note that they will not be allowed entry to the test centre after 09:30 PM for the morning session and 2:45 PM for the afternoon session of the exam. Documents: Candidates are also advised to check the requirement for mandatory documents on Testing Day and comply with the same. NOTE: NBE/ Test Centre/ Designated Agency/ Staff on duty shall not be liable under any circumstances for delayed reporting and/ or non-presentation of mandatory documents. Important: Candidates are advised to preserve their Admit Card till the end of the counselling & admission process.